II: from the Vaal Dam, Vaal River Barrage and Nylsvlei Nature Reserve (South Africa) and the Sand River Dam (Swaziland). Tilapia sparrmanii collected in the Sand River Dam in Swaziland is also noted as a new host record. Since the first piscine trypanosome was discovered from the blood of Salmo fario by Valentin in 1841, more than 190 trypanosome species have been recorded from around the world (Woo 1998). Several authors have recorded piscine trypanosomes from many of the major freshwater systems of Africa (Baker 1960, 1961), however, only three known species are noted from Africa: Trypanosoma toddi Bouet, 1909; Trypanosoma mukasai Hoare, 1932 and Trypanosoma tobeyi Dias, 1952. Baker (1960) noted that nuclear position might be an important factor in separating the three African freshwater fish trypanosome species. It was noted that small morphological differences separate T. toddi from T. tobeyi and that T. mukasai and T. tobeyi might prove to be a synonym of the same trypanosome (Baker 1960). In 1962, Pienaar reported Trypanosoma clariense from Clarias gariepinus (Burchell, 1822) in the North West Province (Pienaar 1962). This species was first described by Fantham (1919) from the same host. It was suggested by Smit, Van As and Davies (2004) that T. clariense might be a synonym of T. mukasai, owing to the apparent common staining properties and morphometrics. Trypanosoma mukasai was originally described from four species of cichlids (Hoare 1932) and has since been known to infect a broad range of fish hosts across Africa (Negm-Eldin 1997, 1998). Some of the most recent records are those of Davies and Van As (2000), Smit, Van As and Davies (2004), Smit, Moll and Van der Bank (2008) and Hussein et al. (2010). According to Smit, Van As and Davies (2004), morphometrically variable haemoflagellates were found within a single host from the Okavango Delta, Botswana. However, despite these findings, they concluded that all Okavango trypanosomes examined might be T. mukasai due to their nuclear indices NI > 1. Since these findings, Davies et al. (2005) reported that two genotypic groups of trypanosomes (even though morphologically similar) are present in the fish from the Okavango. A great deal of molecular research has been done in recent years regarding the phylogenetic relationships of trypanosomes (Davies et al. 2005; Gibson et al. 2005; Gu et al. 2007, 2010; Jakes, O'Donoghue & Adlard 2001; Karlsbakk, Haugen & Nylund 2006; Martin et al. 2002; Seghal, Jones & Smith 2001; Votypka et al. 2002; Votypka, Lukes & Obornik 2004). The aim of this article is to increase the distribution and host data of a species of trypanosome preliminarily identified as T. mukasai. Fishes were collected using fishing rods from the Sand River Dam (25° 59' 16" S, 31° 42' 16" E) (channelled from the Inkomati River), Swaziland (February 2012) and with gills nets from the Nylsvlei Nature Reserve (24° 39' 17.28" S, 28° 41' 27.6" E), Limpopo Province, South Africa (May 2012); Vaal Dam (26° 53' 40.99" S, 28° 8' 43.98" E) and Vaal River Barrage (26° 45' 53.28" S, 27° 41' 30.12" E) from the Vaal River System, South Africa (November 1998 to February 2000 and February 2012). Fish were identified (see Table 1) and blood films were prepared, air dried, fixed with methanol and stained with phosphate-buffered Giemsa solution prior to screening (Davieset al. 2005). Microscopic images of the blood protozoans were captured and the organisms were measured with a 100x oil immersion objective on a Zeiss Axioplan 2 photomicroscope. Standard measurements of the haemoflagellates were taken according to the method of Karlsbakk (2006). No possible leech vectors were observed. Of the 257 fishes collected, positive infections were observed in two families, Clariidae and Cichlidae. Fish numbers and prevalence are recorded in Table 1. No seasonal pattern was notable. Out of the Clarias gariepinus collected from the Vaal Dam, 74% (89/121) were infected and from the VaalBarrage 63% (63/100) were infected (Table 1). A total of 427 parasites were counted in the Vaal Dam over four months, with 262 parasites counted in the Vaal River Barrage. Parasite intensities were not calculated due to the variation in blood volume used for blood film preparation. There was no seasonal pattern observed with regard to prevalence. All 60 Labeo capensis, 57 Labeo umbratus and 35 Cyprinus carpio collected during the same sample trip were uninfected. 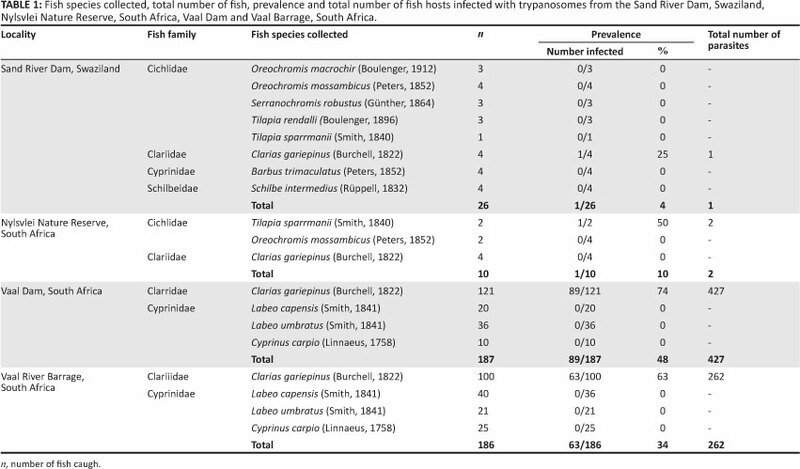 Of the 26 fishes collected from the four different piscine families in the Sand River Dam, Swaziland, 25% (1/4) of C. gariepinus were infected with trypanosomes (Table 1). Ten fish from two families were collected at Nylsvlei Nature Reserve, South Africa. A 50% (1/2) prevalence was found in Tilapia sparrmanii, with two parasites present (Table 1). Trypomastigote sizes varied between the three sites (see Table 2). The cytoplasm is stained dark blue with a pale section anterior to the kinetoplast, the nucleus is stained light pink and the flagellum (undulating membrane) originating near the kinetoplast is trailing anteriorly beyond the body as a free flagellum. The tail is short and almost absent (see Figure 1a-c). Nuclear indices (NI values) (Becker & Overstreet 1979) for trypanosomes measured at all three sites were NI > 1, indicating an anteriorly positioned nucleus (Table 2). As reported by Hoare 1932, T. mukasai measured 40 µιτι - 55 µm in length, with the 'nucleus near the middle of the body and the kinetoplast at the posterior end. The undulating membrane was strongly developed and a short free flagellum is present' (see Hoare 1932). Trypomastigotes measured in the current study have similar body lengths, a nucleus just in front of the midline, posterior kinetoplast and prominent undulating membranes. From this, it can be concluded that the Trypanosoma sp. in the current study resembles and possibly is T. mukasai, which can be confirmed by molecular sequencing. Future research should include molecular assessment of trypanosomes from all three sampling sites. It is evident that a phylogenetic analysis of all freshwater fish trypanosomes of Africa is long overdue, especially to resolve the confusion regarding the synonymy of species. Sand River Dam, Swaziland, Nylsvlei Nature Reserve, South Africa, Vaal Dam and Vaal River Barrage, South Africa serve as new locality records for T. mukasai, and T. sparmanii as a new host record. The parasites were obtained from fish sampled for the approved projects by Mr Beric Gilbert and Mr Ebi Hussain. Ethical clearance was obtained from the University of Johannesburg Faculty Ethics Committee in 2011 for both these projects. Fish were sampled according to the guidelines of a permit obtained from the Gauteng Nature Conservation for Annemariè Avenant-Oldewage and from the Limpopo Nature Conservation for R. Greenfield. The fish from Swaziland were caught during a fishing competition. Potential health and safety hazards were disclosed to the Ethics Committee. Staff and students were covered by the universitity's 3rd party insurance. All researchers participated voluntarily. The University of Johannesburg is thanked for providing the funding for the project. Dr. R. Greenfield and Prof H. Van der Bank of the University of Johannesburg are thanked for providing blood films from Swaziland and Nylsvlei Nature Reserve. M.L.F. (University of Johannesburg) studied slides from all localities, stained slides from all localities apart from the Vaal River and provided the first draft of the manuscript. A.A.O. (University of Johannesburg), provided all of the Vaal River data and slides, and collaborated on various drafts of the manuscript. Karlsbakk, E., Haugen, E. & Nylund, A., 2006, 'Morphology and aspects of growth of a trypanosome transmitted by the marine leech Johanssonia arctica (Piscicolidae) from Northern Norway', Folia Parasitologica 52, 209-215. Smit, N.J., Van As, J.G. & Davies, A.J., 2004, 'Fish trypanosomes from the Okavango Delta, Botswana', Folia Parasitologica 51, 299-303.